In pseudophakic pupillary block, the implanted intraocular lens (IOL) is partly or wholly involved in the obstruction of the aqueous flow through the pupil. This condition can develop days, weeks, months, or years after the lens implant surgery. If the condition is not recognized and treated early, it can lead to iris bombe, iridocorneal adhesion formation (starting at the periphery and extending toward the center), increasing intraocular pressure (IOP), and progressive damage to the optic nerve head. The block is caused via mechanical closure of the pupil by the optic of the pseudophakos or by the development of synechiae between the iris and the artificial lens or remaining lens capsule. Pseudophakic pupillary block also can occur in patients with anterior chamber IOLs, either by direct blocking of the pupil by the optic or by the development of adhesions between the vitreous and the posterior iris. Closure of an existing peripheral iridectomy or an absence of a peripheral iridectomy may be a precipitating factor. Pseudophakic pupillary block is shown in the image below. Pseudophakic pupillary block precipitated by leakage of the incision line. This led to a chain reaction of forward movement of the posterior chamber lens, closure of the angle, intractable glaucoma, and iris-cornea touch over a wide area. Results after surgery of the patient above are shown in the following image. Same patient as in the image above, 1 month after surgery. She underwent iridectomy at 3 places, separation of the iris from the cornea and the optic of the intraocular lens with viscoelastic material, and ab-interno filtration procedure at the 6-o'clock position, with erbium laser. The intraocular pressure is 13 mm Hg. Extracapsular surgery that precedes the insertion of the IOL creates the following conditions that are conducive to inflammatory, proliferative, and fibrotic reactions: retention of a large part of the anterior lens capsule, retained lens matter in the fornices of the capsular bag, a tear of the posterior capsule, and lens-vitreous mix. The inflammatory reactions produce adhesions between the artificial lens and the uveal tissues, particularly the iris. The so-called sulcus-supported lenses have a tendency to erode the ciliary processes and the ciliary body. In the process, a breakdown of the blood-aqueous barrier occurs. The optics of the sulcus-supported lenses have a greater tendency to partial or complete pupillary capture. The fibrous reactions in the capsular bag also can push the optic out of the bag, a process that may lead to the pupil capture. Either of the following can push the lens optic firmly against the pupil, effectively blocking the forward movement of the aqueous and causing partial or complete pupil capture: the shallowness of the anterior chamber due to a wound leakage or pooling of aqueous in the vitreous pushing the lens optic forward. In pediatric patients, the aforementioned factors play a part with much greater severity than in adults. Fibrin formation is encountered more often in children. There is a greater tendency for the optic to come out of the small capsular bag and become captured by the pupil. In neonates and young infants, there is a tendency for the iridectomy opening to shrink (like shrinkage of a continuous curvilinear capsulorrhexis) and ultimately close. The net result of all these processes is iris bombe, anterior synechiae formation, glaucoma, and an increased resistance to the forward movement of the aqueous. Pupillary block can occur if the peripheral iridectomy and the pupil close by the above factors and one of the following is used: an IOL in the anterior chamber, an angle-supported lens, or an iris claw (Artisan) lens. In the pupillary area, the initial adhesions are formed between the pupil and the posterior capsule. As iris bombe develops, adhesions form between the anterior surface of the iris and the optic and the haptic of the IOL. The iris bombe may involve the whole iris; more often, it is multiloculated. Examples of pseudophakic pupillary block in a pediatric patient are shown in the images below. The patient is 6 years old. Closure of peripheral iridectomy, lens decentration, partial pupil capture, and adhesions between the optic and the iris have produced pupillary block. One of the loops has started cheese-wiring the iris. Iris bombe is all around. Iris incision line adhesions are visible. The intraocular pressure is normal. With the help of a vitrector, the central part of the iris has been moved over and close to the optic. No attempt has been made to reposition the optic of the lens. The peripheral iridectomy is left as such. The iris bombe has settled nicely. Pseudophakic pupillary block is not an uncommon condition. The exact incidence is not known, but it occurs more frequently in pediatric patients, especially those who are very young. Failure to relieve the pupillary block can lead to the development of chronic angle closure glaucoma and glaucomatous optic neuropathy. No predominance in specific races exists; however, Nd:YAG laser iridotomy may be difficult to perform in dark-skinned people. The younger the patient, the greater the chance of a pseudophakic pupillary block. The space behind the iris contains the following reactive elements: anterior and equatorial lens capsular cells, remains of lens matter, ciliary processes and ciliary body, and posterior pigment epithelium of the iris. These elements can trigger inflammatory, proliferative, and fibrotic responses in the pupillary area and around the IOL. This ultimately can result in a pseudophakic pupillary block. Such reactions are uncommon in adults, especially after implantation in the bag. In the presence of an anterior chamber angle-supported lens or an iris claw lens, the absence or the closure of a peripheral iridectomy usually initiates the pupillary block. Singh D, Singh K. Transciliary Filtration using the Fugo blade. Ann Ophthalmol. 2002. 34:183-7. Dow CT, deVenecia G. Transciliary filtration (Singh filtration) with the Fugo plasma blade. Ann Ophthalmol (Skokie). 2008. 40(1):8-14. [Medline]. Cohen JS, Osher RH, Weber P, Faulkner JD. Complications of extracapsular cataract surgery. The indications and risks of peripheral iridectomy. Ophthalmology. 1984 Jul. 91(7):826-30. [Medline]. Del Priore LV, Robin AL, Pollack IP. Neodymium: YAG and argon laser iridotomy. Long-term follow-up in a prospective, randomized clinical trial. Ophthalmology. 1988 Sep. 95(9):1207-11. [Medline]. Lynch MG, Brown RH, Michels RG, et al. Surgical vitrectomy for pseudophakic malignant glaucoma. Am J Ophthalmol. 1986 Aug 15. 102(2):149-53. [Medline]. Naveh-Floman N, Rosner M, Blumenthal M. Pseudophakic pupillary block glaucoma with posterior-chamber intraocular lens. Glaucoma. 1985. 7:262. Tomey KF, Senft SH, Antonios SR, et al. Aqueous misdirection and flat chamber after posterior chamber implants with and without trabeculectomy. Arch Ophthalmol. 1987 Jun. 105(6):770-3. [Medline]. Tomey KF, Traverso CE, Shammas IV. Neodymium-YAG laser iridotomy in the treatment and prevention of angle closure glaucoma. A review of 373 eyes. Arch Ophthalmol. 1987 Apr. 105(4):476-81. [Medline]. Vajpayee RB, Angra SK, Titiyal JS, et al. Pseudophakic pupillary-block glaucoma in children. Am J Ophthalmol. 1991 Jun 15. 111(6):715-8. [Medline]. Pupillary block in the presence of a posterior chamber lens. This stereo pair shows the closure of the peripheral iridectomy, dilated pupil, iris lens adhesions, and fibrotic membrane formation in the whole of the pupillary area. A large area of the iris shows iris bombe formation. This 5-year-old child, a case of congenital cataract, earlier had pupillary block and moderate iris bombe, which was relieved by 2 shots of Nd:YAG on the ballooned iris and the peripheral iridectomy opening.Two weeks later, he came back with a much worse pseudophakic pupillary block and multiloculated ballooning of the iris. The intraocular pressure was raised. Pigment and exudates were on the surface of the intraocular lens. The condition was relieved by reopening the peripheral iridectomy site, removing the posterior capsule in the pupillary area; performing iridectomy along the upper pupillary margin, a small central anterior vitrectomy and cleaning the intraocular lens with the help of a vitrector. The anterior chamber was deepened with a large air bubble. The recovery was uneventful. One month postoperatively of the patient above, the cornea was clear, the anterior chamber was deep, a few peripheral anterior synechiae were present, the pupillary area was clear, the pigment on the periphery of the intraocular lens had been reduced, the intraocular pressure was normal, and corrected visual acuity was 20/80. The patient remained free from a pupillary block thereafter. Pseudophakic pupillary block observed in a case of posterior chamber lens. 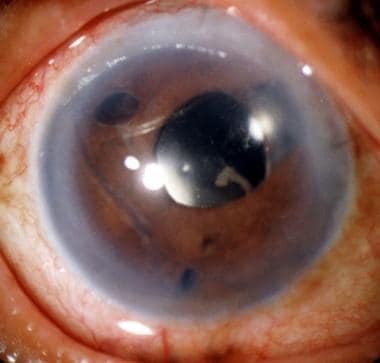 The pupil is closed and deformed by the optic of the lens and the fibrous tissue, but the consequences of pupillary block are missing due to the presence of a patent peripheral iridectomy. 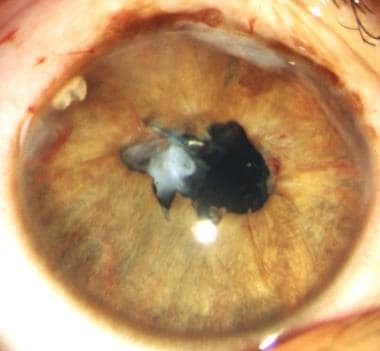 Pediatric iris claw lens implantation, showing a pupillary block that has been precipitated by the closure of the peripheral iridectomy with Elschnig pearls. The pupil has been closed with the optic of the lens. A vertical fibrotic band courses vertically across the edge of the optic. The 360º iris bombe has encouraged adhesion formation between the iris and the perimeter of the lens.Treatment in these cases involves removing Elschnig pearls, opening and enlarging the existing iridectomy, making an additional iridectomy elsewhere, cutting the fibrous band, separating the iris from the optic, doing a small anterior vitrectomy, and enlarging the pupil with a vitrector toward the 12-o'clock position (so that the edge of the pupil goes beyond the edge of the optic). The stereo pair shows pseudophakic pupillary block in a brown eye. No peripheral iridectomy is visible. The pupil is dilated, and the iris is adherent to the optic of the lens. An amorphous, translucent membrane is present on the surface of the lens. The treatment involves a surgical iridectomy, clearing the optical axis of any obstacle, and performing a small anterior vitrectomy. A 60-year-old patient with a light-colored iris presents with pseudophakic pupillary block. Lens implant surgery was performed 6 months ago. The pupil is dilated moderately. 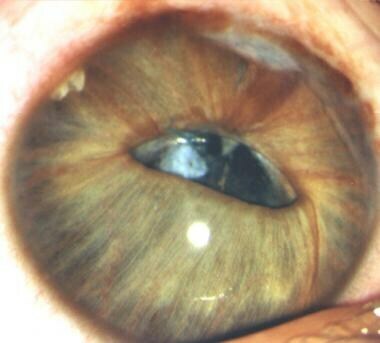 There are adhesions with the optic of the posterior chamber lens. One loop of the lens is pushing itself into the anterior chamber. Iris bombe is seen in 360º. Most of the iris from the 6-o'clock position to the 11-o'clock position is in contact with the endothelium. A round continuous curvilinear capsulorrhexis is visible, in front of which the optic of the lens lies. The patient has been experiencing eye aches for 2 months. Intraocular pressure is 35 mm Hg. A filtration operation for glaucoma with 1 or 2 iridectomies suffices for control of glaucoma and for clearing the pupillary block. Further intervention depends on the progress of the case. 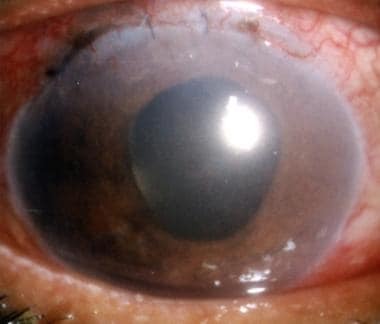 A 56-year-old patient presents with a 4-loop-angle-supported lens. Two loops are visible, while the other loops are hidden under the iris tissue. From the 10-o'clock position to the 3-o'clock position, the edge of the optic is hidden under the overgrown iris tissue. A translucent membrane, 4-cornered in shape, is adherent to the anterior surface of the optic. A peripheral iridectomy is not visible. The pupil is blocked with pigment and scar tissue. The optic of the lens is acting like a perfect lid over the pupil. Iris bombe is all around, more so in the upper half. The endothelial cell count is 1700 cells/mm2. By a quirk of nature, the intraocular pressure is still normal. Light perception and projection are good. An iris claw lens, although virtually unknown in some parts of the world, is an excellent exchange lens. It can be fixed with minimal trauma to the iris and is well tolerated.